Do you believe in miracles? Maybe that’s a bit dramatic. But with 18 holes to play in the Tour Championship, Tiger Woods — Tiger Woods! — is on the verge of making something special happen. A win for Woods, who will enter Sunday’s final round at East Lake three shots clear of his closest pursuers, would be his first Tour title since his fourth back surgery, and the 80th victory of his professional career. As if that weren’t enough, here are seven other ways a Tiger win would rock the golf establishment. 1. It would kick off a new Tiger Phase If you think of Tiger’s career in phases — as in, Tiger the Toddler, and Teen Phenom Tiger, and Hello, World Tiger and Tiger Slam Tiger, and Tiger with Butch and Hank and Sean — this would be the next (once unimaginable) stage of his evolution. We could call him Post-Surgery, Post-Scandal Tiger, Primed for a 40-something Tear. Or something else entirely. Tiger Woods would be a PGA Tour winner again. Remarkable. 2. It would erase the asterisk As impressive as it’s been, Tiger’s comeback season has carried a “yeah, but…” If he claims the title Sunday, we can finally call off the qualifications. No more, “Yeah, but, he hasn’t won.” 3. 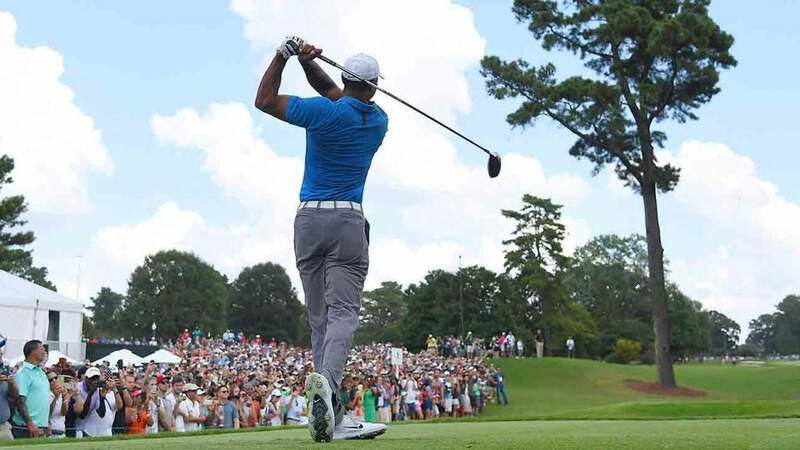 Youth would be served (notice) So many twenty-something studs who came of age idolizing Tiger have said they longed to have a chance to play against him at his peak. Careful what you wish for, kids. Since missing the cut at the U.S. Open, Woods has racked up four top-10s in seven starts and one, well…let’s see what happens Sunday. 4. He’ll have held off heavy hitters Sure, the field at the Tour Championships is small, and some will no doubt claim that that diminishes the win. But if Tiger soldiers on to victory on Sunday, it won’t be for lack of serious competition. He’ll have done so while playing in the same group as his one-time heir apparent, Rory McIlroy, with current world number-one, Justin Rose, nipping at his heels. The Hero World Challenge this is not. 5. It would complete The Comeback on his terms Tiger has talked himself blue trying to temper expectations. Just happy to be back, simply grateful to be playing. Yeah, right. Has anyone ever doubted what Woods was really thinking — that it wouldn’t really be a comeback until he got a win? 6. It would polish the script Like a bandage-wrapped Ben Hogan, claiming the U.S. Open, or a hobbled Willis Reed limping out to center court, a Tiger victory would give the comeback a cinematic moment, turning a happy summer story into a narrative worthy of the silver screen. 7. It would add yet another jolt to the Ryder Cup As if we needed further reason to be pumped for Paris, we would now have Tiger, fresh off a W, firmly in the fray of golf’s fiercest rivalry, no longer merely playing a ceremonial role. Not even the French could remain blase. Vive le Tigre!